How is it of use to journalists? 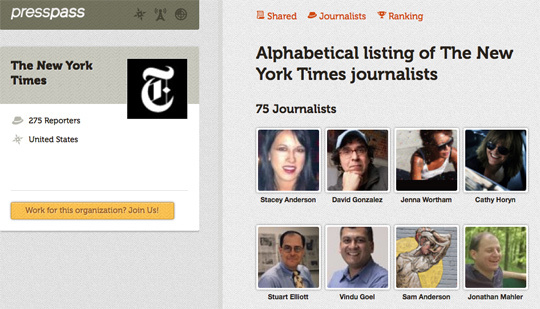 Press Pass allows you to search for journalists on Twitter by “beat, media outlet or region”. It is not an exhaustive list as yet. For example, there are 400 New York Times journalists active on Twitter, but only 275 listed on Press Pass at the last check. Journalists can asked to be added by tweeting to say they report on a beat, work for a title or cover a region. This entry was posted in Search, Social media and blogging, Tool of the Week and tagged press pass, Twitter on February 21, 2012 by Sarah Marshall. This week New York City Law Department issued press passes to bloggers for the first time. In its new rules, to be adopted by the New York police department, will “expressly incorporate online-only media such as blogs”. The changes follow a lawsuit filed in November of 2008 that challenged the existing credentials system, as reported by Journalism.co.uk at the time. In January 2009, three bloggers received press accreditation after suing New York City, following the Police Department’s refusal to give them press credentials because they work for online news outlets. Rafael Martínez Alequin – (Your Free Press), Ralph E. Smith (The Guardian Chronicle) and David Wallis (featurewell.com) launched the action after being denied credentials in 2007. Under the proposed new rules published today, to obtain a press credential, an applicant must show that he or she has covered, in person, six news events where the City has restricted access, within the two-year period preceding the application. In addition to employees of traditional news gathering organisations, the new rules cover self-employed newspersons and other individuals who gather and report the news. The new press card will be issued every two years. A press card allows its bearer, with the approval of police, to cross certain barriers established by the City at news events. Many non-City entities also rely on the City press card to distinguish who is a member of the media. This entry was posted in Journalism, Legal, Press freedom and ethics, Social media and blogging and tagged David Wallis, New York City, New York City Law Department, Norman Siegel, press pass, Rafael Martínez Alequin, Ralph E. Smith on March 5, 2010 by Judith Townend.